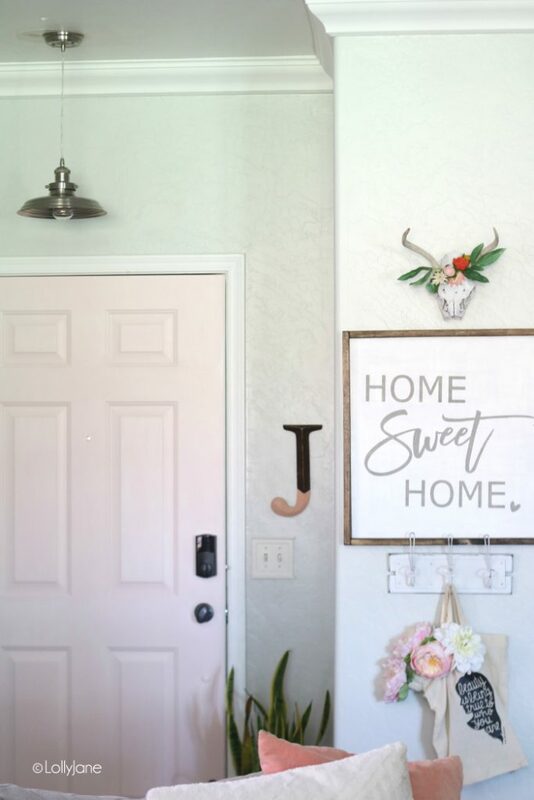 How To Style A Small Entryway - A Few Tips To Make It Look Chic! This post is sponsored by The Home Depot in partnership with Feit Electric. As always, opinions are our very own – on how to style a small entryway. I’m slooooowly crossing off spaces in my house to decorate (after living here for almost 2 years!) and my latest area tackled is the entryway. 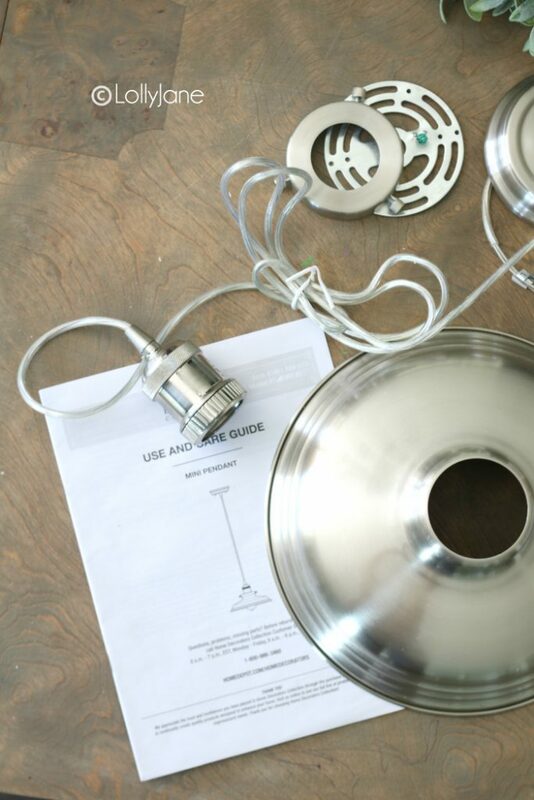 I came across this Vintage Nickle Shade Pendant at Home Depot and knew it was “the one” to replace the current outdated light fixture. Well, after the light was installed, the white door looked outdated so I rummaged through my current paint stash and found the prettiest hue of pink. 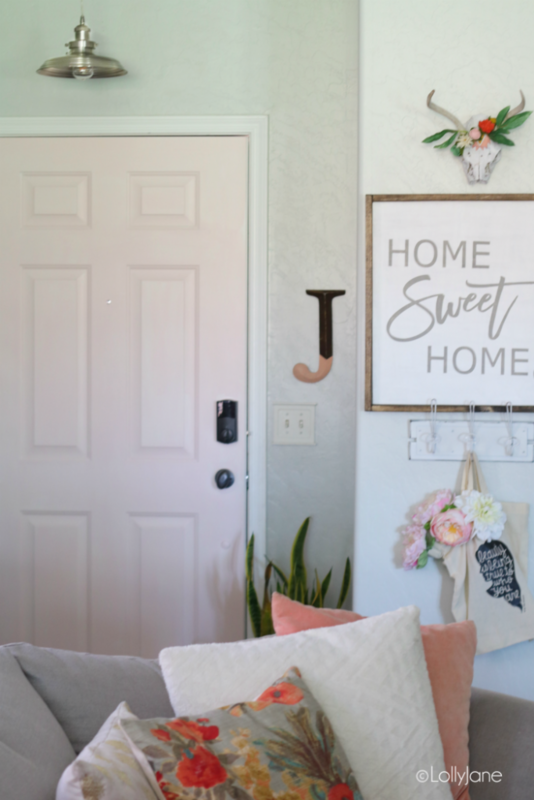 I mixed it with white chalk paint to lighten it up then gave my front door a quick makeover, shopped my house, and now my small entryway is styled and chic! Viola! Take a look at the before, a tad on boring and bland side. 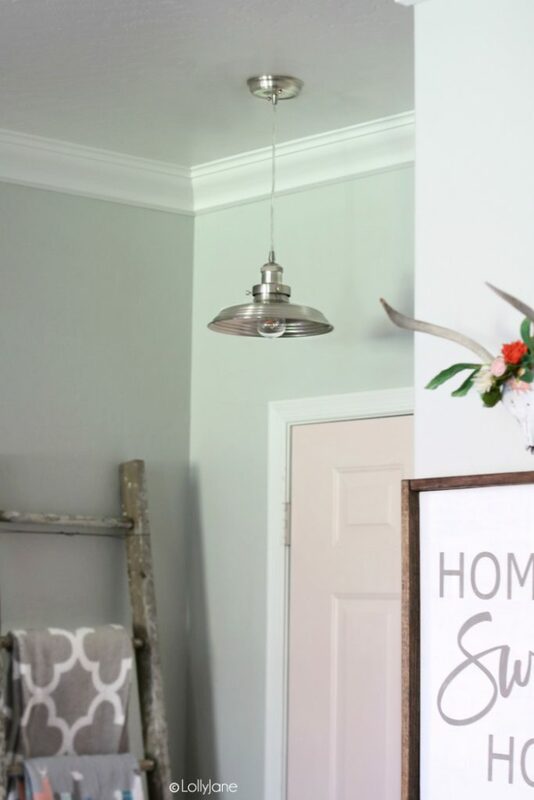 The first order of business was to update the light fixture and this Vintage Brushed Nickle Pendant is not only pretty but the long cord offers height. In my small entryway, anything I can do to make it seem larger is a plus! 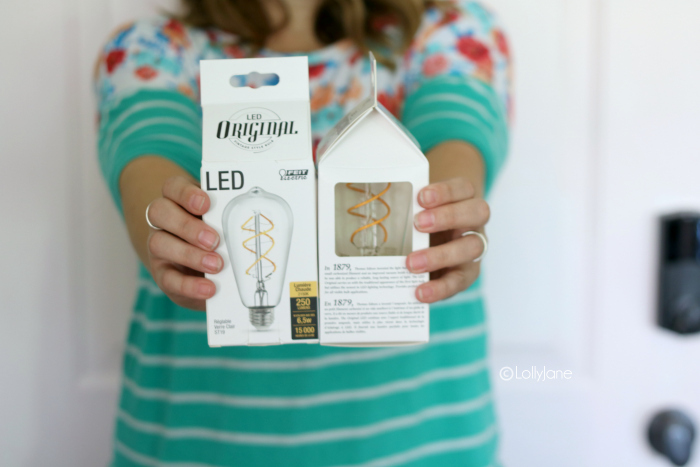 Let’s just talk about this mini pendant for a minute, and those vintage Feit bulbs… what a pair! 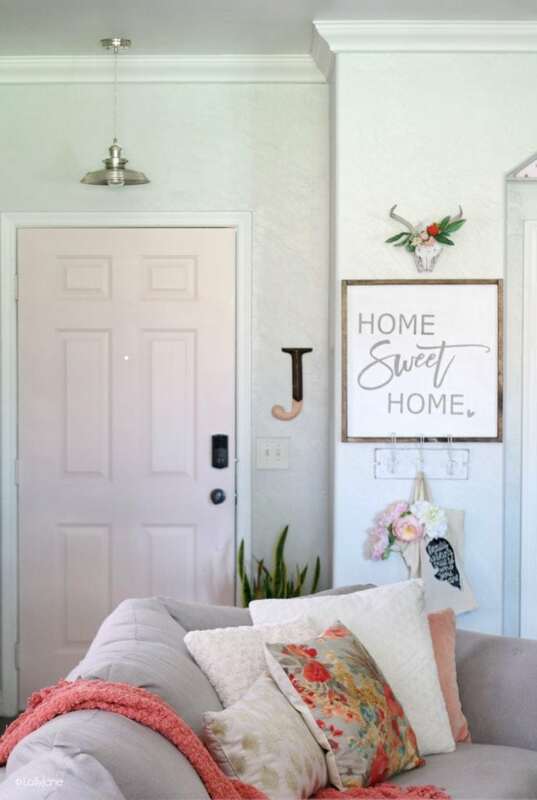 I love the look of old things in a home but really don’t love older things as much… the vintage feel is just perfect for my home and both of these nail it. The pendant was super easy to install as it came labeled and took a few minutes to swap out. What a difference, right? 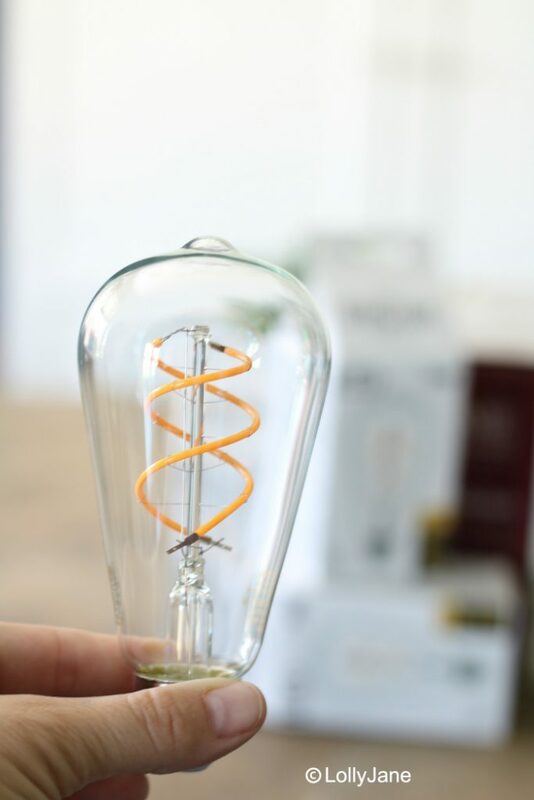 The soft glow of these bulbs is just dreamy! And the packaging is just darling… we are suckers for cute packaging! 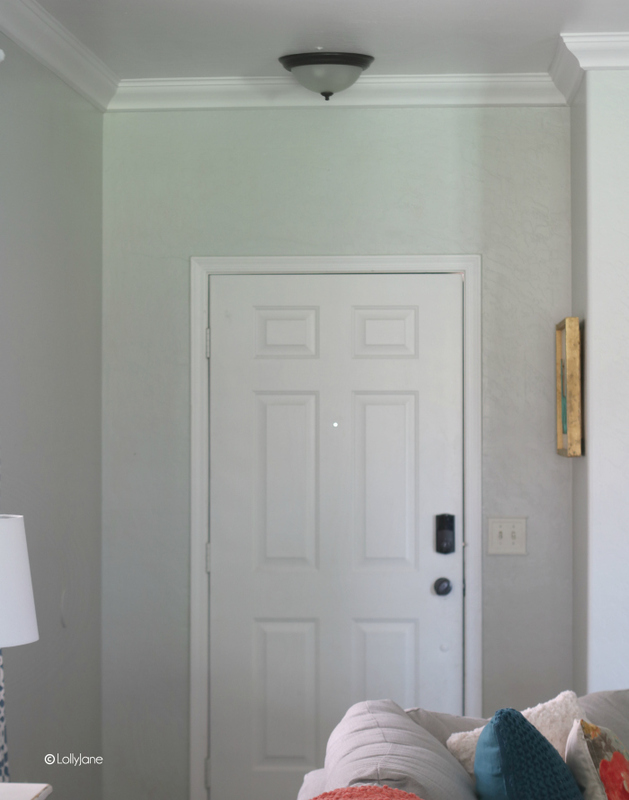 To make this entryway really pop, and to show off the new pendant, try painting your door a new color so everything doesn’t blend together. From there it’s all about the accessories! The letter “J” added some texture and dimension to this little entryway. Adding a houseplant to the space makes it homey and inviting. Flowers (real or faux) soften the space and brighten it up. A fun piece of decor (the floral skull in my case) makes this small space stylish! Hooks are not only pretty but practical, from keys to coats, umbrellas and purses, they’re functional and add texture. I have my couch really close to my entry so I didn’t include a stool but a small chair or stool is great for somewhere to park it when putting shoes on and off. I also love mixing metals… the brushed nickel with the black hardware on the door and the white metal hooks allows for more variety when decorating and everything is able to flow! 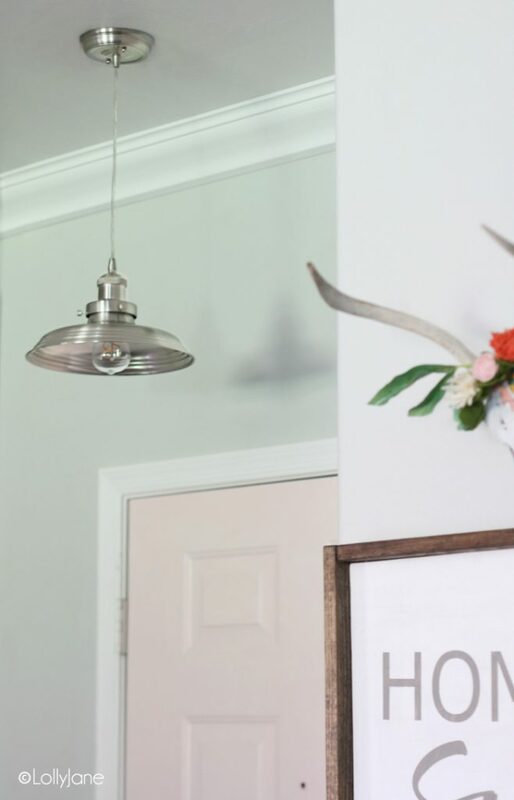 One last peek at that pretty pendant + vintage bulb because it really pulls the entryway together, love it! Do you have a small entryway? What are some tips YOU do to make it look larger or style it? LOVE your painted door! Everything flows together so beautifully ~ I wish I had the knack for that. I never know how to pick colors and accessorize! Thanks for sharing! I do have a small entry way. Currently I just have a small end table with a vase and flowers. I would love to hang a key rack up. Love your ideas! Love the pendant light! We have a small, oddly shaped entryway, too, and I’ve been puzzling about what to do with it. I’ve been thinking about replacing the recessed light above the door with a pendant or small chandelier (knowing that it will need to hang high enough to not interfere with the door opening). So – thanks for the inspiration. That’s a great plan, Mimi! We have a small entry similar to this one and I love how you styled it! Plus that pink door is fabulous! 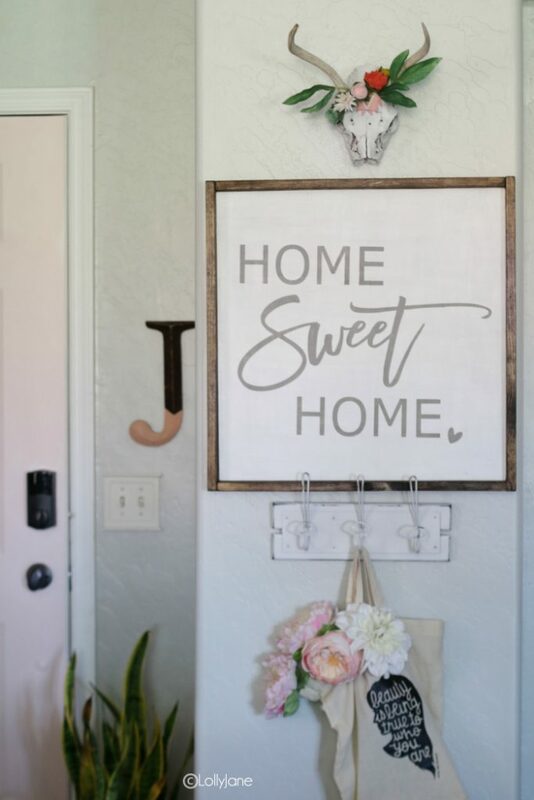 Beautiful ideas and its really nice to see a post with a small entryway. Just because its small doesn’t mean it can’t be pretty. Wonderful examples, thank you. This is such a beautiful space! Thanks for sharing it with us on The Creative Circle Link Party! 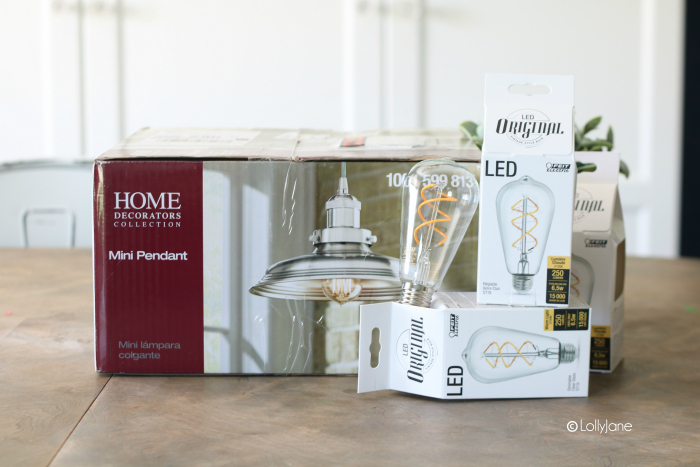 Your pendant light is gorgeous and I would love to replace the outdated ceiling fan/light in my kitchen with one. And don’t get me started on that trendy light bulb, I love it!!! Thank you for sharing with us this week at Celebrate Your Story and we hope you will join us again next week. I love the look. The pink door is genius.